Speaking truth to power is a brave act wherever it is carried out. But when that power is the strongest military force on earth and the one speaking truth is coming from within the ranks of that force to point out blatant lies promulgated at the very top of the organization, then it is indeed a rare form of bravery. Earlier this week, Lt. Col. Daniel L. Davis published a short report in the Armed Forces Journal and coupled that with discussions with the New York Times’ Scott Shane for an article hitting on the same subject area. In those reports, we learned that Davis had prepared much longer reports, both a classified one which he shared with several members of the House of Representatives and the Senate, and a non-classified one which he intended to publish. In the Armed Forces Journal piece, Davis noted that he intended to publish the longer report at his afghanreport.com website, and in an editor’s note, it was pointed out that “At press time, Army public affairs had not yet ruled on whether Davis could post this longer version.” In a very interesting twist, Davis’ long report now has been published, but not at his website. Instead, Michael Hastings, whose The Runaway General article at Rolling Stone eventually resulted in the firing of Stanley McChrystal, has posted Davis’ report (pdf) at the Rolling Stone website, along with a brief introduction from Hastings. There will be a post soon from bmaz addressing Davis’ approach to whistle-blowing and his treatment of classified information. If there were only one thing I could ask you to take away from this rather lengthy brief, it would be this one page. Below you see charted over time, the rising violence from the end of 2005 through the first quarter 2011 (chart source: ANSO, 2011). All spin aside, you see regardless of who was in command, what strategy they used, or what claims they made, nothing impacted the rising arc of violence from 2005 through today. The one thing, however, that has never changed: the upward arc of violence, which continues its rise and is expected to continue at least through this summer. 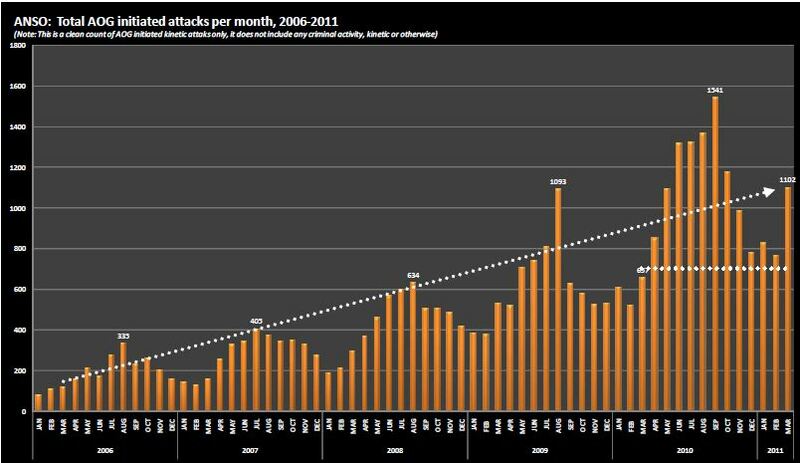 ANSO violence data by year with all of 2011 included. Again, there is no indication whatsoever that any progress in reducing the level of violence is taking place. ANSO is not the only source of violence data. The US GAO also prepares reports based on the same underlying data. I covered the disclosure of similar data in this post from May, 2010 and this post from January, 2011. Senior ranking US military leaders have so distorted the truth when communicating with the US Congress and American people in regards to conditions on the ground in Afghanistan that the truth has become unrecognizable. This deception has damaged America’s credibility among both our allies and enemies, severely limiting our ability to reach a political solution to the war in Afghanistan. It has likely cost American taxpayers hundreds of billions of dollars Congress might not otherwise have appropriated had it known the truth, and our senior leaders’ behavior has almost certainly extended the duration of this war. The single greatest penalty our Nation has suffered, however, has been that we have lost the blood, limbs and lives of tens of thousands of American Service Members with little to no gain to our country as a consequence of this deception. In a 17 October 2011 ISAF press release, General Caldwell said, “I am amazed at the significant progress that the Afghan security forces have made over these last two years. It’s been brought about because of tremendous partnerships that exist in the international community helping get at this very mission.” Yet numerous publicly available reports quantitatively refute these many claims. During my 12 months in Afghanistan I travelled over 9,000 miles and saw or participated in both mounted and dismounted combat patrols in virtually every area US Army troops were engaged. Many of those were joint missions with ANSF forces. What I saw first-hand, in virtually every circumstance, was a barely functioning organization – often cooperating with the insurgent enemy – that was dramatically different than the progressing organization depicted by the Secretary in the March 2011 hearing. The manual also stipulates that an IO cell chief is responsible for ensuring that “IO planners are fully integrated into the planning and targeting process, assigning them to the joint targeting coordination board in order to ensure full integration with all other planning and execution efforts.” Since it is so crucial for the Joint Force to “fully integrate” IO into every aspect of military operations, it is important to understand what some of these inputs specifically require. Two are of particular import: military deception and psychological operations. One of the key questions most readers must be asking about this point in the report, is how could such an extensive, pervasive, and long-running series of deceptive statements have gone unnoticed by virtually the entire country? There are a number of reasons, but perhaps none bigger than the role played by the major media in this country. This is not an issue where “the liberal media” of the major networks failed, or “the right-wing conservatives” of FOX News, nor any other specific network. Rather, it was a cumulative failure of our nation’s major media in every category: network news, cable news, magazines and major newspapers. The code of ethics that suggests it is a journalist’s duty to seek the truth while “providing a fair and comprehensive account of events and issues” seems to be less important than having access to top leaders. Because the military carefully controls access to key figures, it is able to keep the media in line through fear of losing access to the next big story if they publish anything they fear will prevent access in the future. Once we realize the fact that the surge in Afghanistan has not worked, the natural question arises of why it didn’t since the Iraq surge is so widely credited with turning around the violence trend there. After all, both surges have been sold as the model for the new COIN centered around the idea of protecting the population. As is well known, the turning point in 2007 Iraq came when the heart of the Sunni insurgency turned against al-Qaeda and joined with US Forces against them, dramatically reducing the violence in Iraq almost overnight. The overriding reason the Sunni insurgency turned towards the United States was because after almost two years of internal conflict between what ought to have been natural allies – al Qaeda in Iraq (AQI) and the greater Sunni insurgency – a tipping point was reached whereby the Iraqi Sunnis finally and decisively turned against AQI. Had this unnatural split not occurred, by all accounts I have been given on both the Iraqi side and the US military side, “we would still be fighting in Iraq today,” in the words of two officers I know who fought there. There simply has been no turning against insurgents in Afghanistan in the same way there was in Iraq. The COIN strategy has been the same in both places, so it is impossible to escape the conclusion that the military’s current version of COIN alone is insufficient to end violence in Afghanistan. In my view, our duplicity in and around Afghanistan is one of the key problems with our efforts, and where practically speaking, our failures have the greatest negative impact. We continually convey to the Afghan people the same “victory narrative” we share with the American people, but the local population recognizes it for what it often is: fiction. And, of course, Davis points out that if what the US says is commonly understood to be fiction, then there simply is no way to negotiate a peace settlement in the area, because the parties at the negotiating table have no basis on which to believe anything the US promises. If the American people do not demand their leaders be completely honest with them, we all forfeit the ability to determine our own destiny. If our acquiescence for a war decision is gained by some leader telling us a version of events that will result in our support – but that version is not in accordance with what really exists – how can we know whether war or supporting a war is really a good idea or not? Are the American people content to allow selected individuals, for reasons important to them, to decide when they are told the truth and when they are given fiction? When we tacitly know leaders don’t tell the truth and yet do nothing about it, we effectively surrender control to our leaders and give them free reign to do as they see fit. Already we have gone far down this path and as a public have already relinquished considerable control that ought to reside in the people’s hands. It is my recommendation that the United States Congress – the House and Senate Armed Services Committees in particular – should conduct a bi-partisan investigation into the various charges of deception or dishonesty in this report and hold broad hearings as well. In closing, it should be pointed out that Davis doesn’t accuse the entire upper level of the military as being equally involved in the spread of deceptive information. He lists a number of high-level officers he believes to be honest. However, he does lament in the report that those willing to bend the truth seem to be more likely to be promoted, leaving honest officers behind. Some of those become so disgusted with the dishonesty that they resign. Davis’ description of how dishonesty can lead to promotion in the military fits well with many aspects of Michael Hastings’ book “The Operators“, where we see how the staff surrounding Stanley McChrystal put as much effort into information management as it did to military strategy in carrying out its operations. Firedoglake.com will host a book salon on “The Operators” on February 12, 2012 at 5 pm Eastern. Michael Hastings will participate in the online discussion, so it seems likely we can also ask him questions relating to his decision to publish Davis’ report.